The beginning of the Silk Road, Istanbul. Have you ever really sat and thought about the Silk Road? I’ve often wondered if the people on either end of it who bought or sold goods from the other end of it conceived of the world where those goods originated. Did the patrician in western Europe give much thought to what life was like in the place where his highly expensive silk robe was made, for example? Did the east Asians who coveted glassware from the Roman Empire wonder about the civilization that constructed it? I was thinking about these things today as I reached the end of the Silk Road. (Don’t you love how casually that comes out — it’s the END OF THE SILK ROAD!) Conventional knowledge usually suggests that the overland trade route that connected the East and West in the ancient world ended in China. 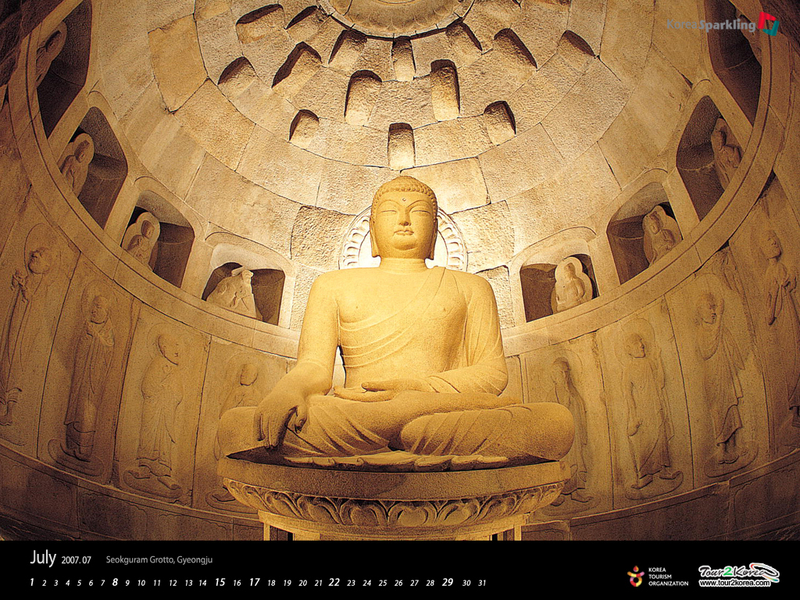 There’s good evidence, and some of it I saw with my own eyes today, that the overland route actually terminated in Korea, and this place, the Seokguram Grotto, in Gyeongju, South Korea, is the terminus. Woa. When I woke up this morning I wasn’t expecting this. We’re staying at the Gyoengju Hilton, which is a five-star hotel that sits on a lake with lots of high-end amenities. There’s a path around the lake that I jogged in the morning, and after a full-service breakfast, we headed to the Hyundai Heavy Industries complex, which is an extraordinary sight to behold. The heavy shipping and technology building center has the biggest dry docks, largest cranes, biggest container ships, etc., and all of this was built in last two generations. We spent morning touring the facility, and then lunched at the Lotte department store cafeteria. Then the rains came in the afternoon, so after getting drenched at another tomb site, we jumped on the bus for the ride up the switchback-turn mountain road to the Grotto. Given the bang-bang nature of our itinerary, contemplating the Silk Road snuck up on me. It’s hard not to think about such things here, thought because the Seokguram Grotto is atop a mountain that could not be more dramatic. The top of the mountain was obscured by heavy rain at first, then lingering low clouds that seemed to be hiding something, as though the mountain was modest and we had just walked in on it in the changing room. The monks who over see the Grotto have considerable political sway here and they’ve been able to keep development almost completely off all parts of the mountain, so all you see as you drive up are tall pine trees, lush vegetation, and large rocks protruding from the never-ending greenery. There’s a parting lot at the top, and from there it’s a 10 or 15 minute hike along a muddy access path (or road, I suppose to the adventurous monk it a 4-wheeler). You go around the last bend and then look up, and there, looking down at you is the front of a small temple. And that’s it. Then end of the road. It’s the end of this dirt road. It’s the end of our hike. And it was the end of thousands of miles of trade networks that stretched from the Mediterranean Sea, across the Middle East, Central Asia, India, and China. This is a location that Herodotus, the father of history, would have written about with churlish glee. I had the great fortune of visiting Turkey in 2006, and while I was Istanbul I visited the market that essentially was the beginning of this ancient trade route. I included a photo of it with this post. What’s missing from the photo are the sounds and smells, which are overwhelming. There are people everywhere. There are all sorts of smells that compete for your attention. There are vendors and salesmen who shout, sing, and pull at you in order to get your attention. The word bedlam usually comes to mind when I remember my time there. Here, at the other end of the Road, there’s a man-made temple built to represent a cave that has the great Buddha, sitting in sublime and simplistic glory, surrounded by bas-relief carvings of a dozen or so of his early disciples and protectors. This Buddha is western-looking: he’s got thick shoulders and arms, and demonstrates proportions that are more characteristic of Greek sculpture values that the rail-thin Buddha more popular in other Asian sculptures. He sits on a pedestal about four feet tall, and he rises perhaps to nearly twenty feet. He, and the chamber he’s in (including all the other figures on the wall) were carved from large granite blocks and constructed on the side of this mountain. The temple is meant to look like a cave, and all together It’s a simple but glorious sight, and a lovely contrast to the hot mess that started this road in Istanbul. I had learned previously that the trade routes connected to the Silk Road promoted the spread of Buddhism from India to the other parts of Asia, but what I didn’t know and learned today was that caves were a big part of Buddhism along the trade routes. Back then security along the road was a big concern, and traders would often seek refuge in caves for the night. Enterprising locals quickly figured out that commandeering a cave and offering travelers safe accommodation in it was possibly lucrative. Most hosts had spiritual help in providing safety — a local deity, for example, might have an alter in the cave and thus would look over you as you slept. The Buddha developed a reputation for being especially powerful, and perhaps travelers sought refuge in caves where Buddha was on display. Thus the idea and message of Buddhism was introduced and spread, and the association with caves began. One of the last things The Buddha allegedly said before he died was “a simple place is fitting.” At the time he was resisting his disciples’ pleas to move him to a great city so he could die in a place of luxury. The Seukguram Grotto is perfectly simple, right down to the smell on this day of a hard rain, and the frogs and cicadas that sang when the rain stopped. There’s a large bell back by the parking lot, which when rung is heard not with the ears but rather with the the heart. The Buddha, so it goes, resides not in heaven or nirvana, but in one’s heart. All of this — the beautifully carved image in the cave-like temple, the mountain refuge, the stillness of spirit and the gentle sounds — are a simple and fitting end to the long road that brought worlds and ideas together. Did you really just say “churlish glee”? Sounds like you’re having a great time! Enjoy!